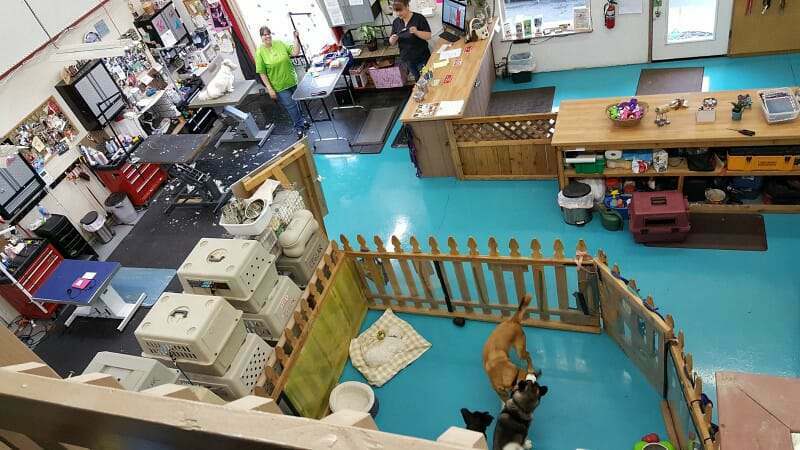 Our curiosity was certainly roused when we were asked by Rust Bullet to review their new DuraGrade Concrete floor coating. 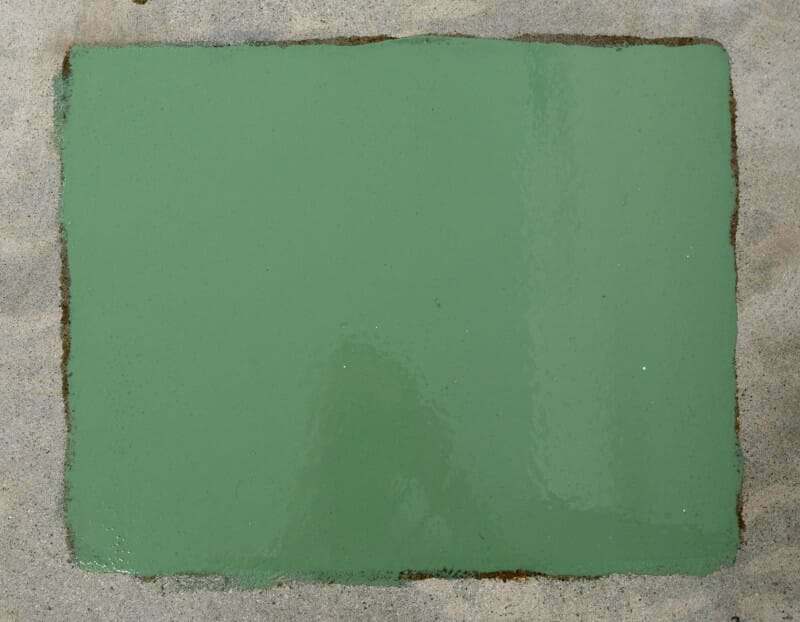 Having shaken the industry a few years ago with a durable garage floor coating that did not require acid etching or grinding of the concrete, we were interested to learn that this new coating would be no exception. After receiving a few samples and doing some of our own testing, we feel that DuraGrade Concrete is going to be a success in more ways than one. Before we discuss why DuraGrade Coating is worth your consideration, it’s of importance to learn a little bit about how Rust Bullet became a noteworthy participant in the garage floor coating market to begin with. 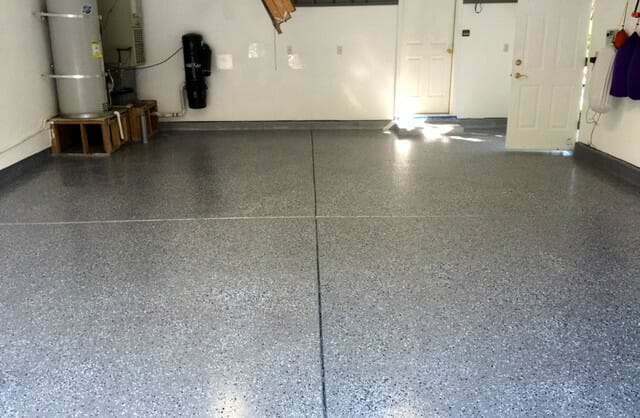 Epoxy for garage floors is still the most popular product that people are aware of. However, concrete coatings have gone through some significant changes in the last few years, much of it due to the fast paced growth of the DIY garage floor coating segment of the industry. 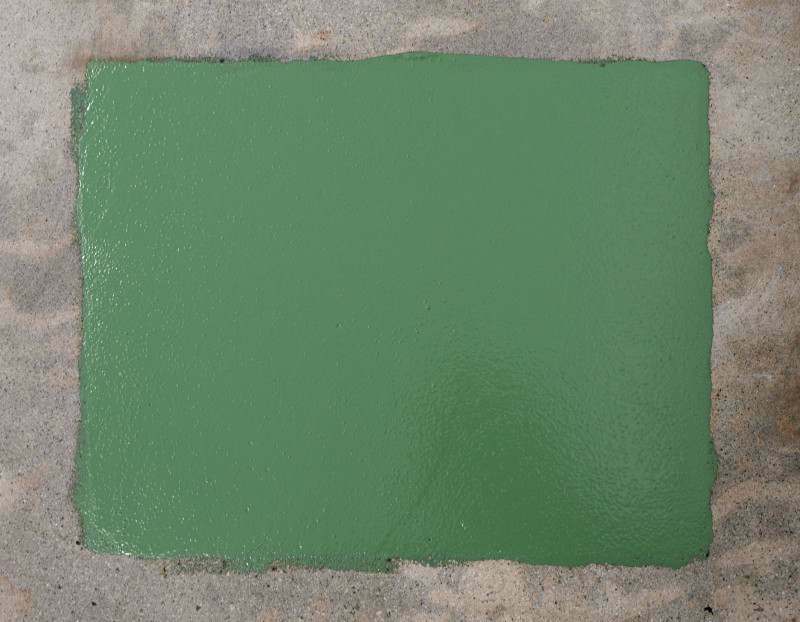 Companies that only produced and/or sold product for commercial concrete coating applications or other industrial uses began to become aware of this fast growing segment. Besides epoxy, they set out to provide additional high performance coatings, all to the benefit of the DIY consumer. Rust Bullet is one such company. They produce and sell a highly regarded single component polyurethane paint coating that is used to protect metal surfaces and inhibit rust under extreme conditions. It is used primarily for automotive, aircraft, and industrial use, including marine environments, farms, and etc. Their first true garage floor coating, Rust Bullet For Concrete, came about when an innovative engineer from Georgia was looking for a durable paint that he could apply to his garage floor. He wanted something that would not require acid etching of his concrete and it had to stand up to chemicals and the dreaded hot tire lift that traditional garage floor paint is known for. Being an automotive enthusiast, he was aware of Rust Bullet and the fact that it could also be applied to concrete. After reviewing the impressive data and testing for their paint, he thought it would be a good candidate for a garage floor coating. After contacting him and learning that his Rust Bullet painted garage floor had been performing flawlessly for over two years, we decided to write an article about it. The article soon caught the attention of a well-respected garage flooring vendor, Garage Flooring LLC, who contacted Rust Bullet asking for more information. The rest, as they say, is history. 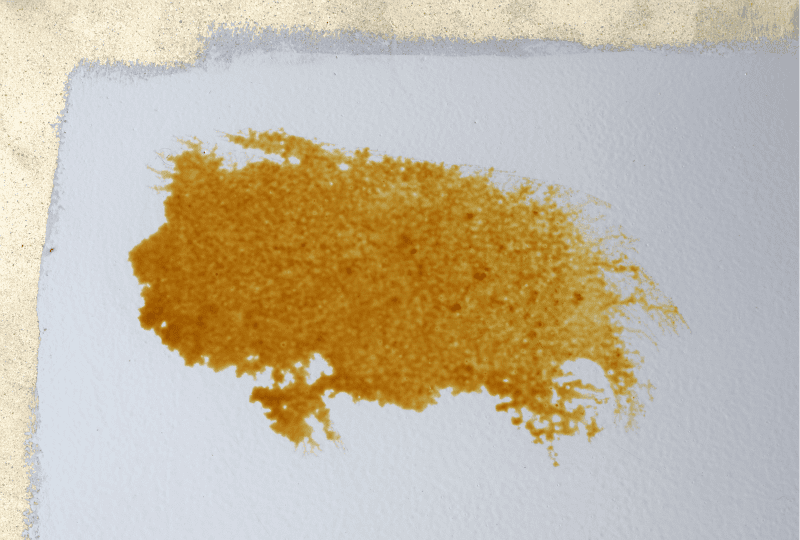 As a result, Rust Bullet For Concrete was formulated and has been a huge success. It has proven over the past few years to be an extremely durable and stain resistant coating that stands up to the harshest of automotive chemicals. However, it hasn’t been without issues and is one of the reasons we feel that DuraGrade Concrete has come about. For example, as tough as Rust Bullet has proven to be, the biggest drawback is that it’s only available in one color – semi metallic gray. It also has to be applied fairly thin. As a result, a minimum of three coats is required for most applications in order to achieve a uniform appearance. It also has a higher VOC content and produces a strong smell that requires good ventilation or a respirator when applying it. 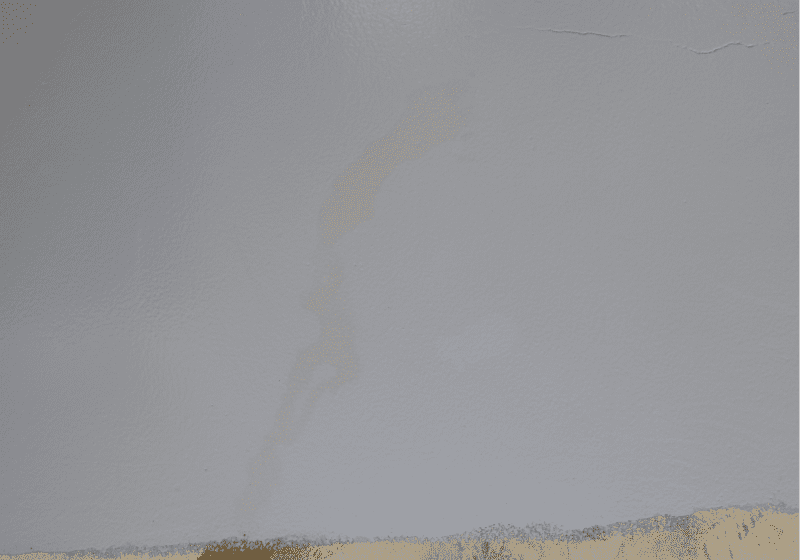 Furthermore, Rust Bullet paint was not initially intended as a garage floor coating and despite the improvement of the concrete formula, there are still some small appearance issues with roller marks if not applied in a particular manner. DuraGrade Concrete was developed to address these small application issues, but more importantly, to make available a concrete coating that fully focused on the garage flooring and concrete coating market. Like its predecessor, DuraGrade Concrete is a high performance single-part moisture cured polyurethane coating. That means there is no mixing of two different components like epoxy requires. It is activated by reacting to the moisture in the air when applied. It also has a higher solids content of 71% vs. 62.5%. This means it can be applied thicker, requiring a minimum of two coats for most applications vs. three. Expect an approximate coating thickness of 8 mils for two coats of DuraGrade vs. 5.5 mils for three coats of Rust Bullet for Concrete. 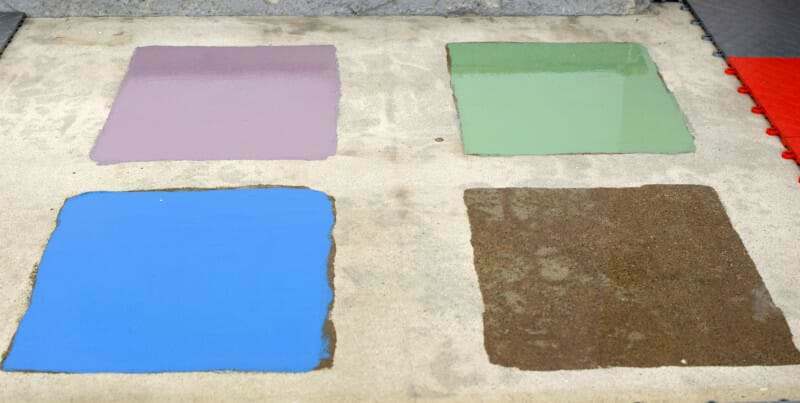 In addition, DuraGrade Concrete is available in 19 various colors plus clear. It is U.V. stable, which means that it will not get a yellow tint (amber) if exposed to sunlight. It has a glossy finish that stands alone brilliantly by itself or you can opt for color flakes and a coat or two of DuraGrade Concrete in clear. This will lock in the color flakes and add build. 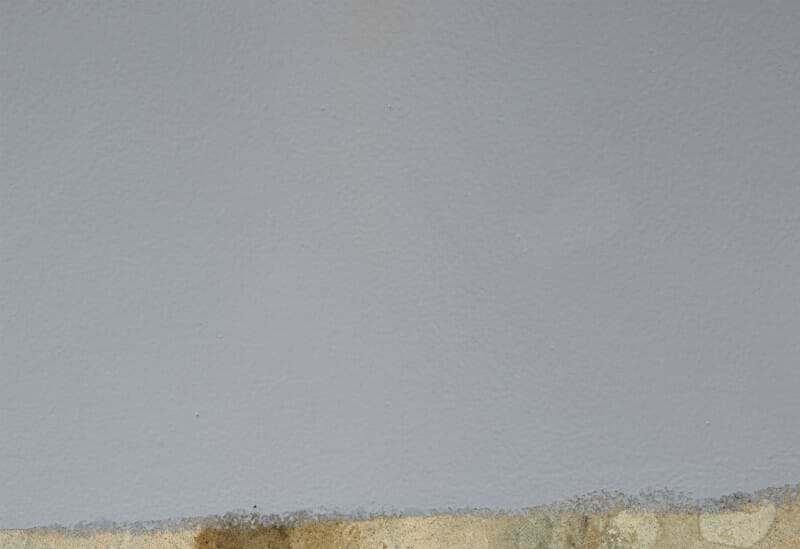 Most importantly to the DIY consumer, however, is that DuraGrade Concrete does not require acid etching or grinding for most concrete surfaces and does not require a primer coat. It is also low in VOC’s. This means no strong smell and it can be shipped to all 50 states. This is a huge benefit for those interested in a true high performance garage floor coating. The biggest anxiety that prevents people from applying their own coating in the first place is the etching or grinding of the concrete surface that is required. To be clear, DuraGrade Concrete can be applied to concrete that has not been previously sealed, power troweled, or troweled extremely smooth. Most garage floors will not have this issue. However, if you do have any of these conditions, then an acid etch, heavy sanding, or grinding will be necessary. Expect a coverage rate of approximately 300ft² per gallon. Keep in mind that this rate is dependent on the porosity of your concrete surface. The required two coats should provide a total thickness of up to 8 mils once cured. An anti-slip media should be applied to the final coat for outdoor applications or if you are concerned about wet grip in your garage. With a working pot life of approximately two hours once poured into your paint tray, you have plenty of time to apply it to your concrete. Yes, that’s right; DuraGrade Concrete is one of the few DIY coatings that we are aware of that is approved for outdoor use as well as in the home and garage. This means that it can be applied on outdoor patios, indoor patios, sun rooms, walkways, and more. With a large color selection that includes much more than your standard tans and grays, we see where this can become a popular coating for such projects. We do advise you to consider a few conditions before you apply it outdoors though. DuraGrade is a coating that does not breathe. It is one of the features that make it a good sealer. The drawback to coatings that do not breathe, however, is that moisture can get trapped in the concrete under the coating. If you have an outdoor concrete surface that shows signs of being wet from under slab moisture at various times of the year, you can run the risk of trapping that moisture. Over a period of time, this can cause the upper most layer of concrete to deteriorate and the coating will eventually lose its bond. In cold climates where freeze thaw is an issue, trapped moisture under a non breathable coating can actually cause spalling. So make sure you are fairly confident that under slab moisture is not an issue. Lastly, when being used outdoors we highly recommend using an anti-slip media in your final coat or the surface can be outright hazardous when wet. Though wet tires on the garage floor, water dripping off the car, and spills can be avoided or easily cleaned up, the same can’t be said for outdoors. For more information about testing and product benefits, you can view their engineering data sheets here. As you can see, these are excellent benefits for a garage floor coating and far superior to any epoxy paint or garage floor coating kit that you will find in a home improvement center. 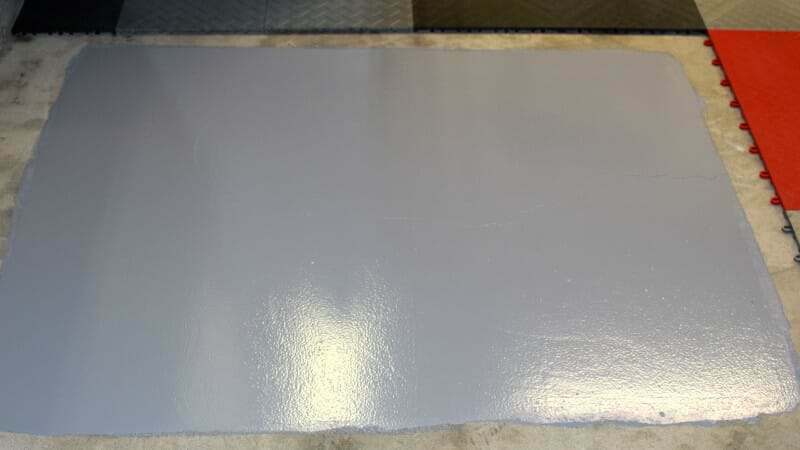 For our sample we opted for Light Grey since it’s a very popular garage floor color. We had them send enough to cover approximately 10-12 square feet so we could conduct our testing. We later received small samples of Lilac, Light Blue, Pistachio, and Clear which we used on a different area of the floor. We didn’t subject these to testing, but instead used them to illustrate color and to demonstrate how Clear looks on bare concrete. Our test area is a garage floor that is currently covered in RaceDeck interlocking tiles. The concrete would have required some cosmetic issues to be addressed as well as many small crack repairs if a coating had been applied. As a result, it has turned out to be a good test floor for us to review samples of concrete repair products, sealers, stains, and coatings. We pulled up a small section of interlocking tile that would be exposed to the car tires on one side of a busy vehicle. We then cleaned the concrete in that section and allowed it to dry for approximately 36 hours. Since the concrete was not overly smooth, we were not concerned with acid etching or grinding. Application of DuraGrade Concrete was actually fairly easy. You can find their application instructions here. You are required to mix the contents for approximately one minute. We did this using a paint stir stick. The key is to mix it somewhat carefully so as not to whip it up. If you do, it will introduce air that can create small bubbles in the coating when it is rolled out. Once mixed, we poured enough Light Grey out into a paint tray for our first coat. We then resealed the can according to the instructions. The first coat rolled out nicely even though darker areas of the concrete showed through. This is completely normal. Being a polyurethane coating, DuraGrade goes on thinner than an equivalent solids epoxy coating would. It is also why a minimum of two coats is required. Do not try to correct for this by applying thicker coats. If you do, the coating will experience solvent flash. This produces an abundance of tiny bubbles over the entire coating which will have to be sanded out once it cures. DuraGrade requires waiting 2-6 hours between recoats. It should feel dry to the touch and not transfer on a gloved hand. Since it’s a moisture cured coating, the amount of time you need to wait between recoats is dependent on the humidity. For example, the humidity was only 24% when we applied the Light Grey coating that we used for our testing. We had to wait almost the full 6 hours before recoating it. When we later applied the other colors that we received, the humidity was 73% and we were able to recoat in just over 2 hours. The second coat went on just as smooth as the first coat and completely covered the darker colored concrete that was bleeding through. If you have opted for color flakes, it would be at this point that you would toss the color flakes onto the floor. Though DuraGrade Concrete is low in VOC’s, that does not mean there is no odor. It does have a chemical smell, but it does not get nearly as intense as Rust Bullet for Concrete and it dissipates fairly quickly once it begins to cure on the floor. Once cured, our test coating had a nice gloss finish to it with very consistent coloring. Duragrade Concrete requires 6-12 hours before walking on the floor, 24 hours curing time before moving items back onto the floor, and 72 hours to cure fully. You can drive on it after that.  Something that we want to point out that will be quite evident in a few pictures to come are some of the cracks that run through the coating. We are always getting questions about the necessity to repair cracks before a coating is applied. Many assume that since a coating is self-leveling, small cracks should not need to be repaired. As you can see, that is not the case and we wanted to use this chance to demonstrate that. The fact that you can clearly see the cracks has no bearing on the performance of Duragrade Concrete. All coatings will do that, some more than others. 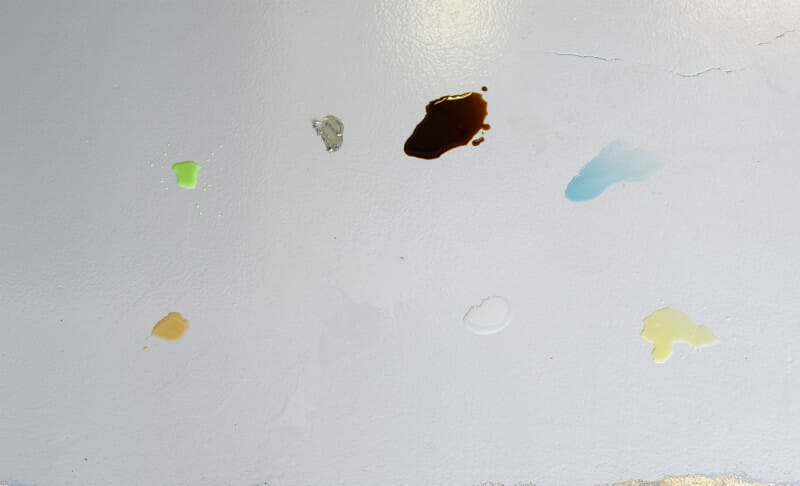 We later applied the Lilac, Pistachio, Light Blue and Clear in another area of the floor to get an idea of how these colors look and what affect Clear has if optioned as a top coat. As you can see, the Clear on the bare concrete darkened it up and revealed all the different characteristics of the concrete. This is typical of a clear coating and why some people find it very attractive. DuraGrade Concrete in Clear would make an excellent option to apply over stained concrete. We then applied Clear over the Light Blue and the Pistachio colors. The result is a glossier finish that almost looks wet with a deeper look to the coating. Below is an example of what Pistachio looked like before and after Clear was applied. If you click on an image you can note the difference in reflections. Once DuraGrade cured completely, we began to conduct some of our own tests. The first thing I want to state is that these tests are unscientific and your results may vary. 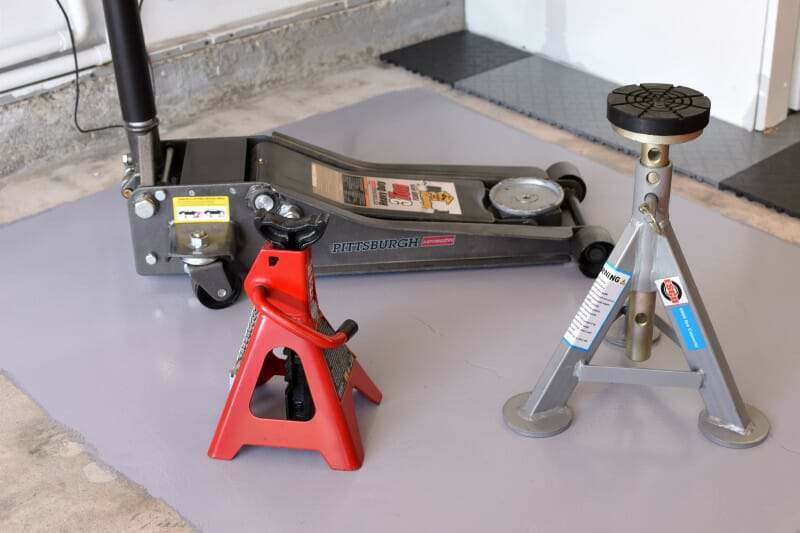 All Garage Floors is not a testing lab. 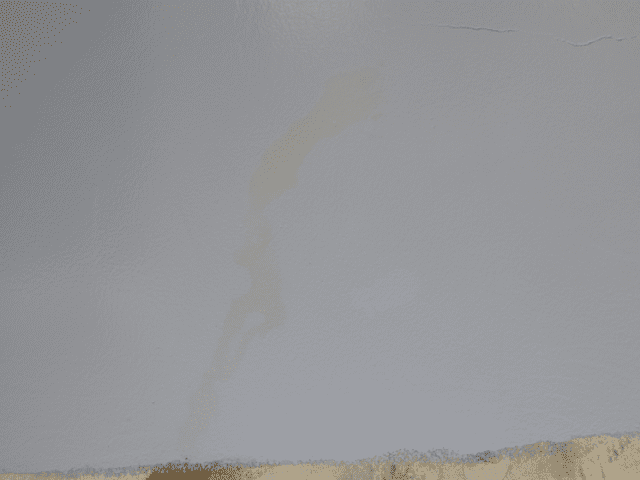 However, we are very familiar with the various chemicals and abuses that a typical busy garage floor coating can be subjected to, so we do our best to simulate some of that and give you our results. 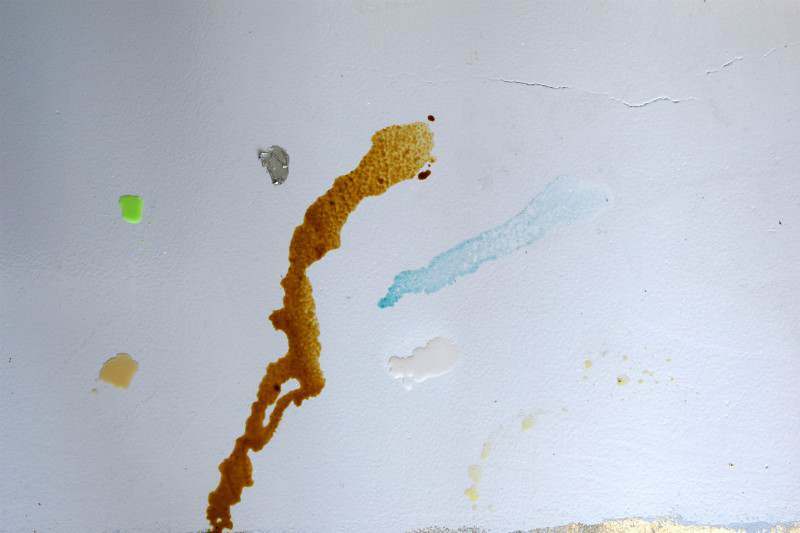 The first thing we did was the chemical stain test. We subjected DuraGrade to a variety of chemicals and automotive fluids for 24 hours. 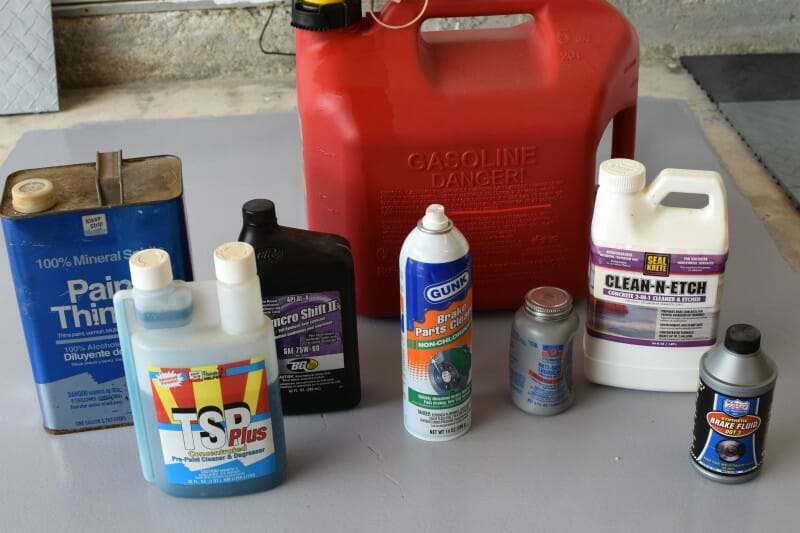 Some of these chemicals include used motor oil, brake cleaner, brake fluid, automotive coolant, transmission fluid, gear oil, mineral spirits, etching solution, and more. We then wiped them up using only Windex and a rag. Most everything came up clean with no evidence of it ever being there with exception to two chemicals, one of which surprised us at first. The first one was brake fluid. This did not surprise us at all since brake fluid, if left to sit, can dull or discolor all but the most chemical resistant coatings to some degree. Still, it was not easy to detect. The one that surprised us was the used motor oil. You can definitely see a stain in the first picture. It almost came completely clean when we wiped it again with some mineral spirits. You can click on the image to make it bigger. We contacted Rust Bullet about this since motor oil should easily clean up with most coatings. They were just as surprised as us when we sent the pictures and needed to talk with the product engineers. Before Rust Bullet could get back to us with an answer, we soon discovered why this had happened. The used motor oil came from a 5 gallon container that we use for recycling oil and other automotive fluids. As it turns out, just over a quart of old brake fluid from a recent DOT 5 brake fluid flush had been deposited earlier into the container along with some brake cleaner and other various fluids. 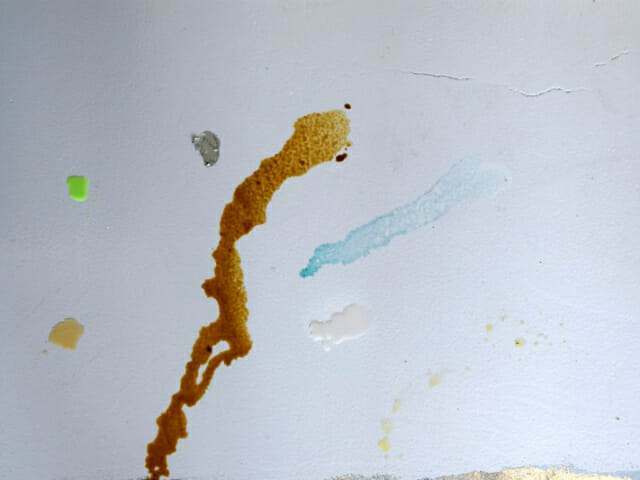 Since the brake fluid test slightly discolored the coating, it soon became apparent why the oil with all the brake fluid in it left a slight stain. We immediately tested the coating again with used motor oil that was not contaminated with brake fluid. This time we left it on the coating for a few days. The result this time was no staining to the DuraGrade Coating and it retained a nice clean look. This was a more realistic test since used motor oil from a vehicle will not contain brake fluid. We also felt that leaving it on for a few days was prudent as well. As a result, we feel that the previous stain should not have a negative bearing towards the performance of DuraGrade in that respect. We then subjected the coating to an 80lb steel wheeled floor jack and jack stands. We slid the jack back forth on the coating trying to simulate typical use. We then lifted one side of a 3800lb vehicle a few times placing it on each of the two different jack stands in the picture. We also placed some of our weight on the jack stands and slid them in circles on the coating. The results were negligible. You could not see scarring or marks unless you got down at a certain angle in the light. You could then detect some of the slight marks on the floor from the floor jack wheels and jack stands sliding on it. This is typical for most performance coatings. We then dropped various hand tools from approximately 3-4 ft. These included a combination wrench, screwdriver, pliers, and a tape measure. The results were no damage. One of the benefits to DuraGrade Concrete is that polyurethane is more flexible (relatively speaking) than epoxy and as a result can be more impact resistant. Next we deliberately tried to scratch the coating. Putting some pressure to a screwdriver we were able to leave some marks and light scratches, but it did not affect the integrity. However, when we tilted the three legged jack stand onto a sharp edge of the steel pad, we were able to scratch through the coating with some effort. Because DuraGrade Concrete is not the thickest of coatings, we would consider this fairly normal when allowing for the effort required to create this damage. We left this small test section of the floor open for a couple of months in the winter. This allowed a busy car to park it’s left front wheel on the coating and drive back and forth on it as it came and went each day. We didn’t clean it all. At the end of two months and a few rain storms, it easily cleaned up and looked like new again. Lastly we checked to see how slippery it may be when wet. Glossy polyurethane coatings are typically more slippery than epoxy and this one is no different. If wet slip resistance is a concern, then we recommend using an anti-slip media in the final coat. If you are on the fence about using anti-slip media, one thing to consider is that coatings do gain some wet grip after they have been exposed to traffic for a while. They tend to develop an abundance of microscopic scratches on the surface that reduce some of the initial slipperiness of a new coating. Another consideration is that anti-slip media will lessen some of the gloss if that is a concern. 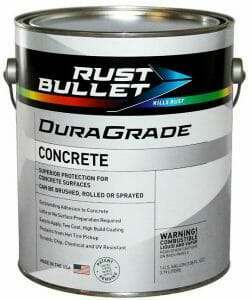 DuraGrade concrete can be purchased directly from Rust Bullet if you wish. You can find their product page with pricing here. If you are a fan of Amazon, you can purchase it there for the same price with free shipping. Lastly, Rust Bullet has packs of the optional colors flakes that you can purchase as well. There are 5 different color combinations. At the time of this article, they are only available for purchase from Amazon. Currently, pricing for DuraGrade Concrete is just slightly more than the high performance single-part polyurethane coatings. It’s a difference of less than 10 cents per square foot. However, for the additional pricing you are gaining the benefit of application without concrete prep and a larger color selection to choose from. To be frank, we feel that Rust Bullet gained a small niche in the garage floor coating market almost by accident. The introduction of the original no concrete prep coating created a small stir among concrete coating vendors in the DIY coating industry. They felt that such a product surely would not adhere well or take much abuse. Despite some of the drawbacks we listed, the doubters were proven wrong and it quickly became a popular option for those looking for a durable garage floor coating that required no acid etching or grinding. We feel that DuraGrade Concrete fully launches Rust Bullet into the concrete coating market with a highly viable product. The advantage of not requiring acid etching or grinding and the multi-use feature of being approved for outdoors as well as garage floors, indoors, and basements, are great benefits that will attract a much larger audience. Will it perform just as well as Rust Bullet for Concrete? In terms of overall chemical and abrasion resistance we feel it will not, but that is not a bad thing. In order to provide a low VOC moisture cured polyurethane that goes on thicker with high quality cosmetic features, colors, and ease of application, solvents had to be reduced and compromises had to be made. Overall though, we were impressed with how DuraGrade Concrete performed to our unscientific testing as well as how easy it was to apply. I would have to say that with some exceptions, it’s much like preparing and applying paint to a wall. If you can do that, then you can apply DuraGrade Concrete. Because it is polyurethane, it still goes on thinner than other coatings and might be a deal breaker to someone with an older concrete floor that needs repairs or is rough in texture. The thin nature of the coating will not cover these cosmetic issues as well as a thicker coating would. Thin does not mean it is not durable, however, and you can always disguise concrete irregularities with the addition of color flakes. We feel that its direct competitor may very well end up being the newer single-part polyurea coatings. These we would rank as the next level up in terms of performance when compared to DuraGrade Concrete and they are slightly less expensive at this time as well. However, DuraGrade Concrete gains the advantage of no concrete prep and a much larger selection of colors to choose from. Do we recommend it? If you are looking for the easiest garage floor coating that you can apply that still performs as a high performance coating should, then DuraGrade Concrete is definitely a great option to consider. It’s a good value that will return years of service for your time and investment. Do you guys think DuraGrade Clear will work well as a clear top-coat over Dyco silicone acrylic? Great website, it’s really useful and has tons of information. I would suggest a full article or maybe even a section reviewing and comparing DIY options for driveways and carports. Hello Rick. No, DuraGrade Coating would not be compatible with an acrylic finish. It would cause the acrylic to soften and bleed through the clear as you were rolling it on. An acrylic clear is your best option. If Dyco has been applied in a garage (not outdoors), then you could apply a clear water-based epoxy, but it will require that you rough up the finish first. This article here explains why actual clear coatings do not work well with acrylics. I have an old garage concrete floor that has some old sealant over it and a lot of stains and small cracks and chipped out marks. Should I mechanixcally grind it before fixing the cracks and chips or do I grind it afterwards? Hi Steve. Usually you can make all repairs first and then grind. However, since you have a sealant on the concrete, old stains, and etc, we would recommend that you grind first if it’s feasible for you. This will give you a better idea of what you are working with and promote better adhesion of your repair products. Once repairs are made, you will then grind those flush with the rest of the floor. Nice review with practical and typical homeowner use. I’m actually in the market for finishing my floor: new house with three car garage that will see occasional shop use: car repairs, projects, etc. 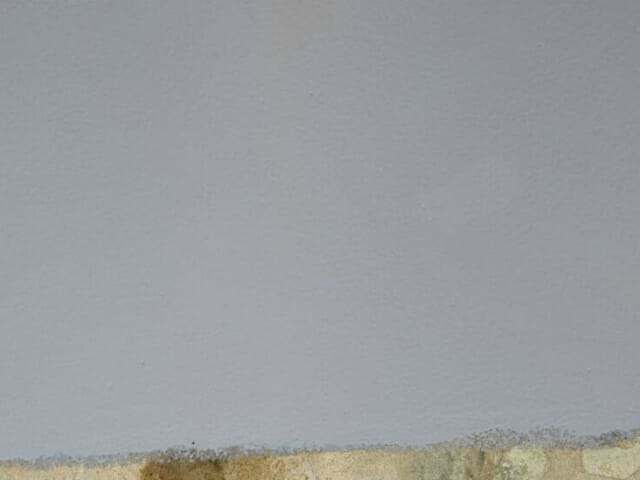 When you performed the testing of the Light Grey Duragrade, was the clear coat applied or was it the standalone coating? If it was the stand alone coat, I’m curious if you feel the clear coat would have stood up better to fluids, scratches, etc? Also, thinking long term, if needed, can the product be re-applied (touched up) after a clear has been applied? The application instructions didn’t exactly specify, but I imagine you could sand the area down, re-paint and then re-clear? Thoughts? Thank you! Hi Tom. No, the test area of the light grey did not have DuraGrade clear applied. Rust Bullet is marketing it as a coating that does not require a clear coat so we wanted to test it as such. The grey did a good job standing up to all the harmful fluids that we tested on it. Brake fluid did create a slight stain, but you usually only encounter brake fluid when servicing the brakes. As long as the fluid is not allowed to sit for long you should be fine. The only real issue we had was when we applied oil from our recycle container. It had a concoction of used motor oil, DOT 5 brake fluid, brake cleaner, and other misc fluids in it. It wasn’t a realistic test from that standpoint. That does not mean that a clear coat should not be used, however. DuraGrade clear provides the same protection, it just has not been tinted for color. A clear coat is always a good idea as it acts as the sacrificial coat. Besides creating a slightly glossier look, any scratches that are suffered rarely go down to the color coat and so they are less obvious. Also, any stains that may be incurred are in the clear and not the color. This can make it harder to detect. Lastly, if the coating ever gets to the point where it is looking dull from heavy use, you can always rough the surface up with 120 grit sandpaper and apply a new coat of clear to make the floor look brand new again. This is true of most clear coats. I was planning on using Rust Bullet coating based upon a happy customers recommendation. Now I have found out about the new product, DuraGrade. Do you recommend DuraGrade over the original if color is not an issue? What do you recommend I do first to prepare the floor. I have fairly large areas of a 25’x25′ garage floor with 1/4″ + spalling. Do you recommend a product for filling this all in? Hello Gary. 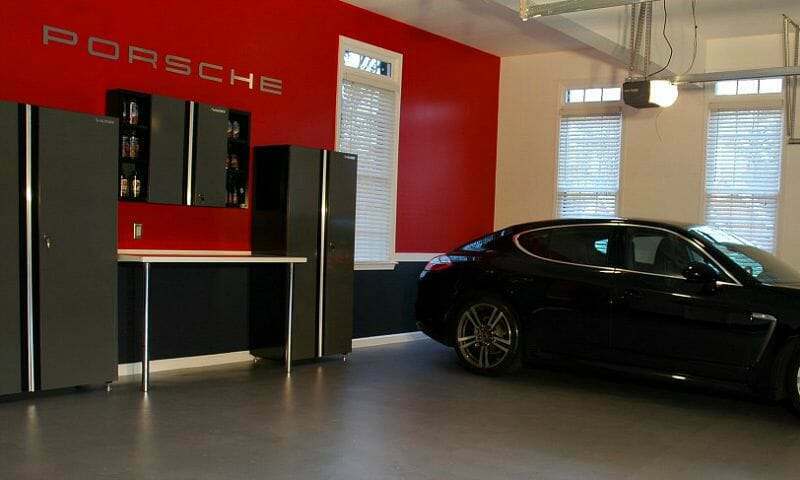 Before we can give you a good answer, how do you plan on using your garage? Did you read our section at the bottom of the article “Final Thoughts” that discusses which is better? For the spalling of your garage floor, we have a good article here that discusses the different materials that you can use to repair it. Keep in mind that with all that repairing, you will most likely need to grind your entire floor afterwards in order provide the best adhesion for the floor coating and to create a smooth transition from the repaired areas to the original concrete surface. The spalling/pitting is not as deep as 1/4″ after taking a look at it. I had read your article on pitting repair and an planning on using one of the recommended products. So, I understand that you recommend grinding after pitting repairs even if I use the Rust Bullet “no grinding needed” product? My main reason for interest in the Rust Bullet product is the lack of required prep. That is correct about the grinding, Gary. There are two reasons for this. The first is that repairs need to be ground flush with the surrounding concrete in order not to telegraph through the coating and be noticeable. It’s the same reason that an auto body shop sands their fender repairs or a carpenter sands flush his wood repairs before painting. The second reason is that most repair materials do not absorb water well and need the rougher surface to achieve a mechanical bond. Epoxy and polyurea repair products in particular are sealants and do not absorb liquids at all. Hi again Shea. I have researched Ardex CD Fine and think it is a good bet for my pitting. Would Rust Bullet DuraGrade be a compatible sealer. Ardex docs say waterborne coatings, but don’t say it’s a must. I have not been able to find if DuraGrade is water-borne. Hi Gary. Yes, DuraGrade Concrete will work fine over Ardex. In fact, most polymer-modified cements designed as a wear surface (not underlayments) will accept most coatings, stains, and dyes. It will require a light grinding or heavy sanding (40 grit) in order for it to adhere properly though. Thanks. Yes, I am planning on grinding, as I will have quite a large area of Ardex fill. Want the final result to be as smooth as possible. Hello and great website! Rust Bullet recommends 2-6hrs between recoats. If adding full color flake, do you think it would be ok to wait 12+ hrs before adding a clear topcoat? I live in a dry climate and am trying to strategize my coats. Thank you! Hello Wes. Yes, you can wait that long on a full color flake floor without issue. The first clear coat sinks into all the nook and crannies of a full flake floor and holds tight. We recommend contacting Rust Bullet before you attempt a full flake coverage, however. Full flake floors generally need 7-10 mils wet film thickness in order for all those flakes to sink in and take hold without creating little bare spots. One coat of DuraGrade is not that thick. They should be able to tell you if it will take or not. 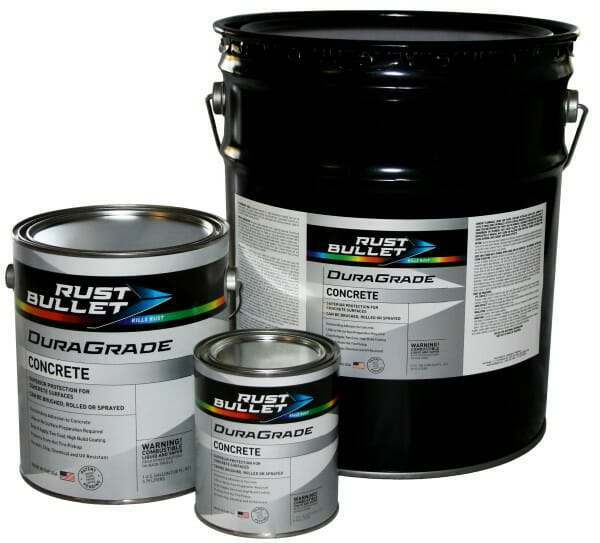 Could Duragrade go over regular Rust Bullet for Concrete? Or would the two coatings not be compatible? Hello Adam. They are not compatible for chemical adhesion during the curing process. However, if the Rust Bullet is fully cured you can rough it up with 120 grit sandpaper and then apply DuraGrade Concrete over it to achieve a mechanical bond. I have a plain (some cracks) concrete driveway leading to my garage. (750sq. & 30 degree grade) would Duragrade be also good enough for that? in the outdoor environment of Florida? How long will it last in the summer sun? parking hot tires on it? How many coats, and Gallons will be needed? Thank you. Hello Ariel. while you could apply DuraGrade to your driveway, we would not recommend it. DuraGrade is a high gloss concrete coating that would require you apply an anti-slip additive since it will get slippery when wet. A 30 degree grade is steep and even with the anti-slip you may encounter problems with traction. For 750 square feet you would require approximately 5 gallons for two coats. Thanks so much, What would you recommend instead if you wanted to do it? beside that at $180. per Gallon x 5 (on Amazon) it would be just too expensive . What is your goal exactly, Ariel? Are you just looking to seal the driveway? If so, we would recommend applying a siliconate sealer. These are inexpensive relative to coatings, easy to apply, and they will not change the traction or looks of your concrete. Hi Shea! Love the website. We have a 24×28 foot shed/garage that is not used for vehicles, just lawn mowers and ATVs, rolling storage shelves and a work area. The floor is unsealed with a small amount of oil staining I can clean. A couple of times a year, everything is cleared out for parties! I would like to paint the floor in a white and black checkerboard pattern with two foot squares. I am expecting I will need to add something to keep it from being too slippery. Should I add that to the second coat of white before taping it for the black? Seems like I’m not going to get a very clean edge that way. Can I use something other than the expensive duragrade for the black? Hello Peg. Doing a checkered pattern with a concrete coating is quite a project that can take a while. It requires a lot of tape work and good timing for removing the tape. Wait too long and the tape becomes part of the coating. White is a tough color to work with on concrete as well. 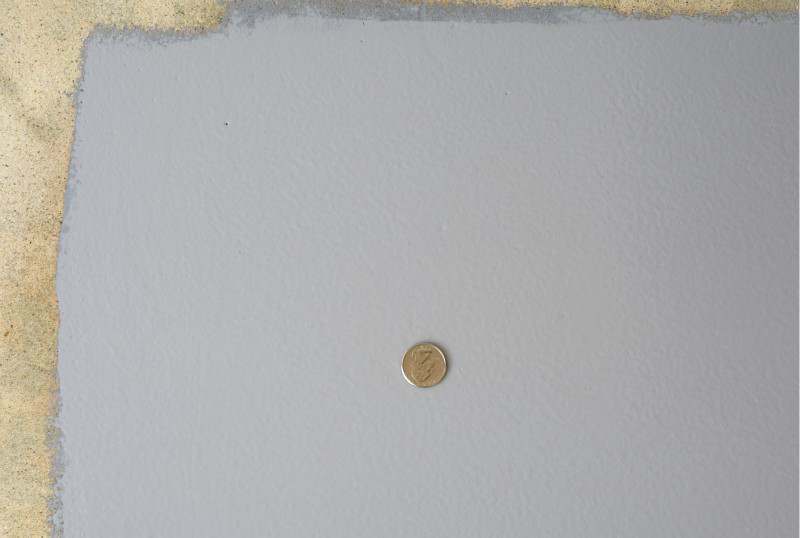 It will require a minimum of two coats (most likely three) to prevent the concrete from ghosting through. The easiest way to do the job would be to coat the entire floor in white first (minimum two coats) and then tape it off for the black. You cannot mix brands of coatings when doing a project like this. To achieve anti-slip properties when it gets wet, it would be best to apply a coat of clear to the entire floor with an anti-slip additive mixed into the clear. Very interesting and informative website. Well done. 1. You said that under slab moisture is a concern for outdoor concrete. Is it a concern for garage floor concrete? 2. If so, would the MVT test (which you described here: https://allgaragefloors.com/concrete-moisture-test/ ) tell me if I have under slab moisture? 3. The pictures of the Pistachio coating with and without the clear coat look fairly similar on the computer. Since you’ve seen it in real life, I’m curious which look you personally prefer? 4. The manufacturer offers a custom color option. Do you happen to know how this would work? Maybe I would send a sample to them and they would match it? Hi John. Yes, moisture can be a concern for a garage slab – more so if it’s below grade. If it’s not below grade and you live in a drier climate then it’s rarely a problem. The easiest way to avoid any moisture issues with a garage slab would be to install a vapor barrier before you pour the slab. And yes, you can do the MVT test as described. The best time to test is in the time of year when it is most wet. The clear on the pistachio is slightly more glossy with a deeper look to it. It’s hard to pick up those differences with the camera. A clear coating is always a good idea in most cases as it protects the color coat and makes it harder to see any scratches that may occur. 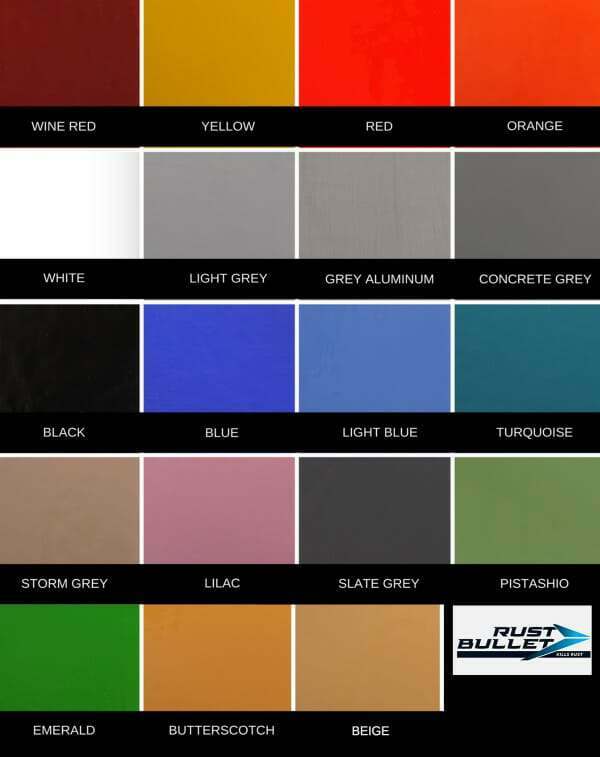 We suggest that you contact Rust Bullet about the custom color option. That is something new that they are now offering. Do you still recommend DuraGrade? I noticed a reseller popular on forums has stopped promoting it. Has something changed that makes it no longer a good option? Yes we do, DJ. I think you may be confused with two different products that Rust Bullet offers. This product here is DuraGrade Concrete. The other product you are referring to is Rust-Bullet for Concrete and is only available in a semi-metallic gray. We even reference it in the article above. The vendor that no longer offers Rust Bullet for Concrete that you read about in the forum had some disagreements with Rust Bullet over customer service warranty issues. He has high standards for customer service and one of the many reasons we like his company. As far as we know, it’s still a very successful product for Rust Bullet. HI, we would like to paint the floor of a newly constructed workshop that will get very light use. Which product is easier to install, RB DuraGrade/(white) with Rust Bullet clear coat or ArmorPoxy (pallet kit) in white? Which do you think will wear the best? Thanks for your info. Your website is amazing! Hello Tracey. The DuraGrade product is going to be easier to apply. The concrete may not need etching either if it passes the water absorption test. The ArmorPoxy Job on a Pallet in white is a commercial quality system that is going to be the most durable, but it will require etching or grinding. That said, DuraGrade will do just fine for a workshop that will get very light use.